Lots of Articles are published here, so scroll down to see them ALL! 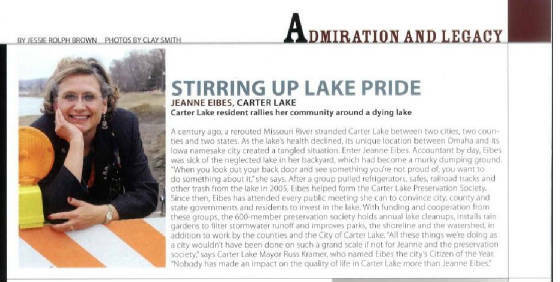 The Metropolitan Area Planning Agency (MAPA) received a 2013 Innovation Award from the National Association of Development Organizations (NADO) Research Foundation for the Carter Lake Water Improvement Project. The association’s Innovation Awards program recognizes regional development organizations for improving the economic and community competitiveness of our nation’s regions and local communities. MAPA Executive Director, Greg Youell, received the award at the NADO 2013 AnnualTraining Conference in San Francisco, California, where award winners were showcased. Carter Lake is a 315-acre oxbow lake that lies in the Iowa-Nebraska border, and accordingly is maintained by both states, with shoreline in the cities of Carter Lake, Iowa and Omaha, Nebraska. The lake is highly productive but has historically exhibited poor water quality, high nutrient concentrations, frequent algae blooms, and periodically high bacteria. Carter Lake has a drainage area of 2,722 acres and relies on surface runoff for water. The watershed consists of primarily urban residential and commercial properties. 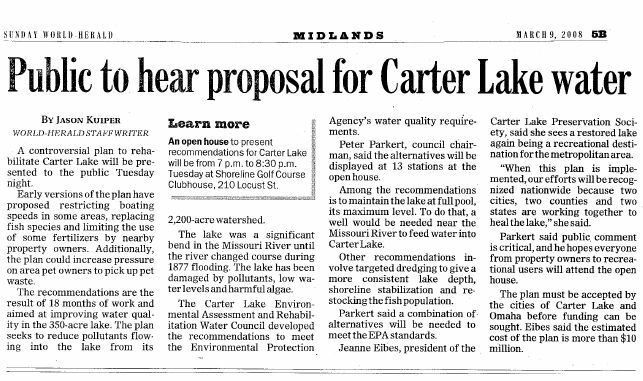 Restoration of Carter Lake began in 2010 and included stabilizing thousands of feet of shoreline, installing sediment forebays, dredging parts of the lake, and enlarging a stormwater pond. These actions resulted in a healthy, stabilized water environment with increased clarity. This is a significant and lasting impact in a well-used natural feature in the metropolitan area. The project is an example of creative and effective collaboration between public agencies. Two states and numerous organizations participated in the project, helping to leverage investments in order to turn the lake back into an effective natural resource for the metropolitan area. 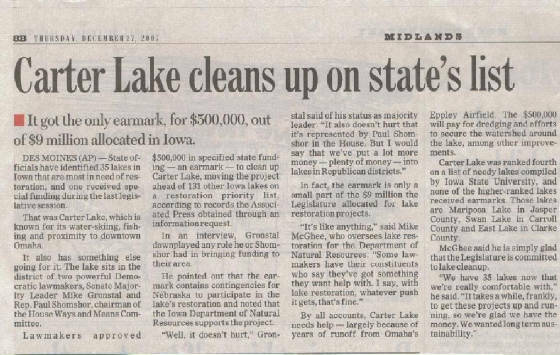 “For many years officials and citizens desired to restore Carter Lake, but ran into obstacles because of its geographic and political situation. As a regional agency, MAPA was uniquely positioned to assist with funding from several agencies in two states. We are proud of the work that has been accomplished in restoring one of the metro area’s gems and believe that the project has been a win-win for everyone involved,” Youell stated. Lynn Dittmer, Community and Economic Development Manager, led MAPA’s efforts in coordinating and administering the bi-state project. The Metropolitan Area Planning Agency (MAPA) was asked to participate in the project as a regional planning partner, primarily as the project’s fiscal agent. Contracts were received by MAPA as an eligible funding recipient in both Iowa and Nebraska, and were then paid out to a contractor working in both states. MAPA was positioned to access funding from all partners and remove regulatory and legislative hurdles governing the use of funds for this project. 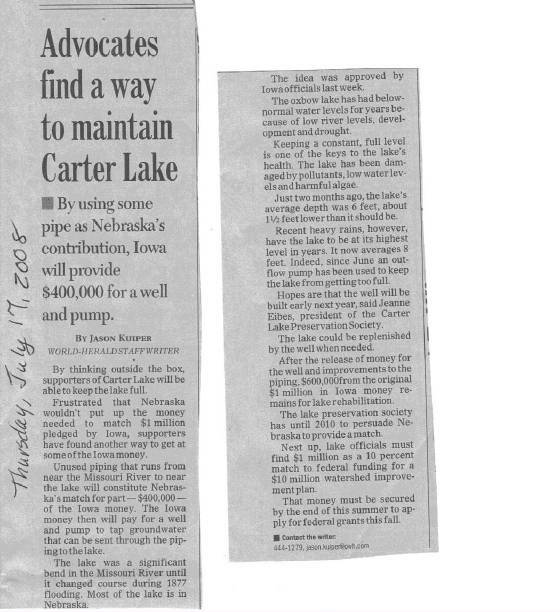 Agencies participating in the Carter Lake Restoration project include the Iowa Department of Natural Resources, Nebraska Game and Parks Commission, Nebraska Department of Environmental Quality, Nebraska Environmental Trust, Papio-Missouri River Natural Resources District, and the City of Carter Lake. 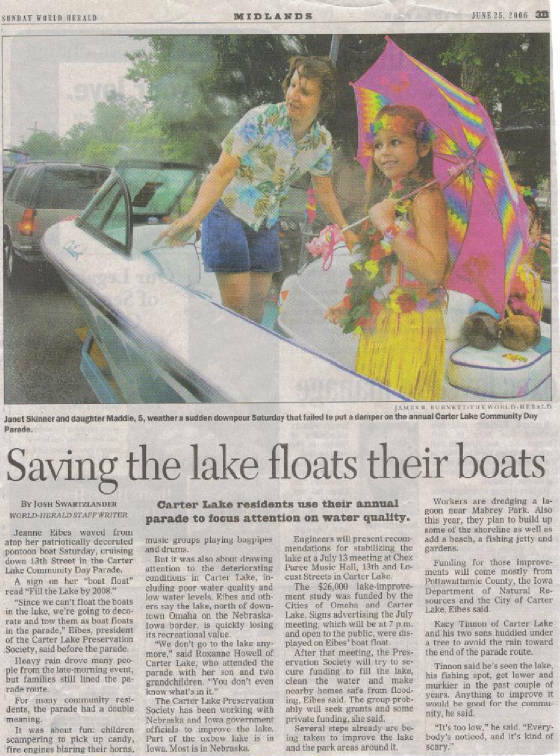 In total, more than $5.3 million has been secured and utilized for engineering and construction activities to restore the lake’s environmental quality. NADO is a Washington, DC-based association that promotes programs and policies that strengthen local governments, communities, and economies through regional cooperation, program delivery, and comprehensive strategies. The association’s Innovation Awards program recognizes regional development organizations and partnering organizations for improving the economic and community competitiveness of our nation’s regions and local communities. Over 650 development professionals and elected officials attended NADO’s 2013 Annual Training Conference, held August 24 - 27 in San Francisco, California.